Ed collected a bag of samples and put up two claim markers – the second claim, he called “Graveyard.” He then traveled to Tucson to file his claim, and afterward struck out for Signal, Arizona (now a ghost town,) where his brother lived, hoping for a grub stake. When Ed’s brother, Al, wanted no part of such a wild venture, the disappointed Ed took a job for a short time in the McCracken Mine. However, he continued to search for help. Soon, he took his samples to Richard K. Gird, a Signal assayer, who pronounced that Schieffelin’s ore was very rich. Gird immediately offered to finance the development of a mine for a 1/3 interest in the claim. Brother Al, quickly changed his mind, upon finding out this information, and also became involved, the three becoming equal partners. On the way back to the mountains Ed found two more sites laden with silver ore, registering the claim as “Lucky Cuss” and “the Toughnut.” All of Ed’s claims would soon become mines. In no time at all, word spread that silver had been discovered and other prospectors began to search the area. Before long, more mines began to open including, the Grand Central, the Charleston and the Contention mines, and a mining camp was born named after Ed’s first claim – Tombstone. Tombstone’s post office was established December 2, 1878 and has never been discontinued. On March 5, 1879 an official town site was laid out and lots were sold on Allen Street for five dollars each. Soon, Tombstone had some 40 cabins and about 100 residents. As word continued to spread more and more people began to come to the area including the Earp brothers who began to arrive in the fall of 1879. 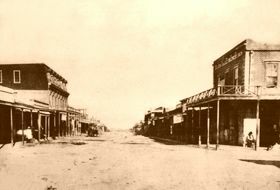 Tombstone quickly became a boom town. Ed Schieffelin was more interested in prospecting than in becoming a businessman a continued to prospect the area. When he returned after a four month prospecting trip, his brother Al had found a buyer for their claims as the capital required to develop silver mine was more substantial than the partners could afford. The brothers, Al and Ed would soon sell out their interest for $600,000 each, while Richard Gird took his payment in company stock. Gird would eventually make a considerable amount more as a conservative estimate of the mines ended up producing some $40 million dollars in silver, an amount that would equal $1.7 billion today. Ed Schieffelin took his money and left Tombstone traveling for an extended period then pursuing a new mining adventure in the Yukon. When Wyatt Earp arrived in Tombstone in December of 1879, he planned to establish a stage line but soon discovered there were already two in the town. Instead, he partnered with the owner of the Oriental Saloon to run a gaming business for a quarter percentages of the proceeds. He also took a side job as a shotgun rider on the stage lines for Wells Fargo shipments. 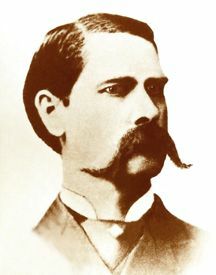 James Earp established a saloon on Allen Street. 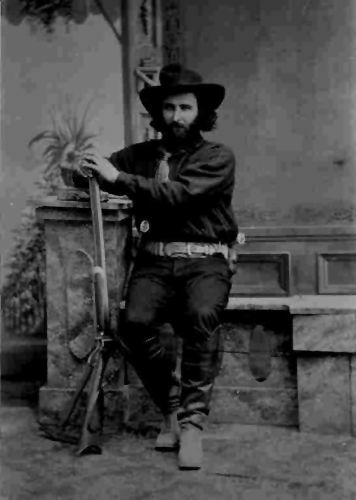 Virgil was already deputy marshal of Tombstone and Morgan went to work with his brother as a lawman. Doc Holliday and Big Nose Kate would arrive in Tombstone in early 1880. Kate quickly realized the opportunity in Tombstone, setting up a large tent with several girls and lots of cheap whisky, becoming the first “sporting house” in town. Doc resumed his habit of gambling as usual. Before the arrival of the Earps there was a working faction of cowboys in the area that lived off of rustling cattle and robbing stagecoaches. These included the outlaw Clanton Gang, with “Old Man” Clanton and his sons, Ike, Phin and Billy. Others included the McLaury brothers, Frank and Tom; Curly Bill Brocius, and Johnny Ringo. The notorious cowboys and their followers lost no time in expressing their displeasure at the arrival of the Earps. On May 1, 1880 the Tombstone Epitaph, the oldest continuously published newspaper in Arizona, was begun. By June, 1880 there were some 3,000 people in the new town which had attracted its share of drifters, dancehall girls, outlaws, saloon keepers and gamblers. 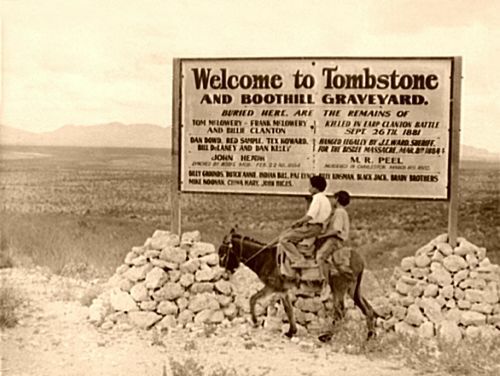 Before long, Tombstone would be hailed as one of the most violent towns in the Southwest. The Tombstone, Toughnut and Richmond Mines were producing millions in silver and the town continued to grow.